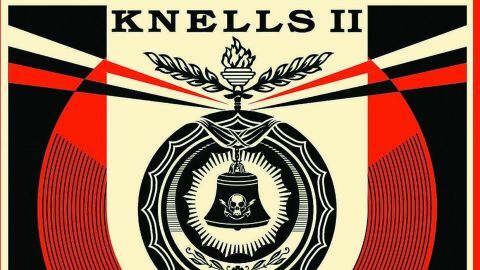 Four years after their debut, Brooklyn-based octet The Knells – guided by guitarist and principal writer, Andrew McKenna Lee – return with another intriguing, mesmeric album. Aside from the vibrant guitar and muscular drumming, this band’s unique signature sound emanates from the beautifully written three-part harmony vocals of Nina Berman, soprano, Charlotte Mundy, mezzosoprano and Blythe Gaissert, contralto. With a delivery that’s more akin to medieval polyphony, their sweet yet sour voices shimmer and glow. Like silver and golden threads woven deepinto the fabric of the music, they assuage the often acerbic scrape of their instrumental backing with layers of silky emollient. Yet the lyrics are often anything but soothing. Andrew McKenna Lee’s guitar soloing occasionally evokes Steve Howe’s zesty flurries, especially on the instrumental Bargaining, which hangs initially by a bluesy thread that quickly unravels into a flurry of starry harmonics. Alongside a tension and exhilaration that’s both beguiling and challenging, an unsettling quality prowls. In an age of identikit prog rock it’s good to have a band with such a distinctive voice.